New Hampshire Power of Attorney Forms provides a legal method by which a New Hampshire resident may appoint another to be their proxy in certain situations. That means that the person appointed would stand in the place of and act for the person who appointed them. There are many different types of POAs depending on the circumstances of the principal (the person who makes the POA). Some convey broad powers over property and assets while others are for more limited circumstances. They all require that the principal choose someone they trust. All forms should comply with RSA 506:6. Durable Power of Attorney – Grants financial powers that extend beyond the principal’s incapacity (cannot make his or her own decisions due to mental or physical disabilities), if the principal had not previously revoked it. General Power of Attorney – Also grants general financial powers to another, however, unlike the “durable” form, if the person is determined by a physician to be unable to make his or her own decisions, the document becomes void. Limited Power of Attorney – Allows for the appointment of a person to act in a special situation. Medical Power of Attorney – A health care form that gives a person the opportunity to appoint another person to make health decisions in the event that they are unable to do so. Signing Requirements (§ 137-J:14): Two (2) witnesses OR a notary public. Minor Child Power of Attorney – A selected guardian is a way in which a parent can give another adult authority to make decisions on behalf of their kids if they are going to be away or unable to do so themselves. 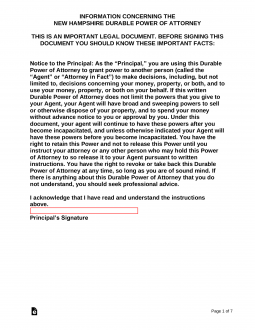 Revocation of Power of Attorney – A termination is part of a two-step process to revoke a previously entered into POA – in addition to filling out the form, the revoker must also let the agent and others know about the cancellation. Signing Requirements: Unmentioned in State statutes; notarization is recommended. Real Estate Power of Attorney – Meant for the specific use of handling a sale, purchase, or to be in charge of the undertaking of real property. Tax Power of Attorney (Form DP-2848) – A tax POA allows a person to give authority to another to represent them in tax situations. Signing Requirements: Principal only (unless POA is granted to a person other than an attorney, certified accountant or preparer of subject tax returns; in which case a witness is required). Vehicle Power of Attorney – An agent may be used in motor vehicle situations where a person needs someone to represent them for titling and registration of a motor vehicle.